Now a day, we can see a number of commercial properties around us which not only attract the businessmen but the common man too. Commercial properties are meant to be a common hub for everyone who includes everything under one roof which is definitely a point of attraction. 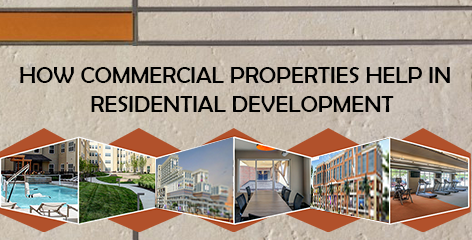 Now, through this blog, you will get to know about how commercial properties help in residential development. People are more likely to find a home for themselves in the area from where they can get every possible facility. This is why commercial properties are on a hike and it could boost up the residential properties even in the interiors also. Along with it commercial properties provokes the development of other social projects also. Now the point it how is beneficial in the growth residential development? Well! It is well understand that modern commercial hubs are packed with different kind of ultra modern facilities such as departmental stores which helps people to shop their day to day groceries shopping, entertainment zones which includes PVR’S and other gaming zones for children as well, fashion stores which helps people to shop their favorite apparels, food courts helps in fulfilling the need of foods. In this way, these above facilities of commercial project are enough for setting up a residential flat nearby, because it fulfills the every required need of common people. Apart from this, the extravagant new distinguished commercial hubs also impacts with the residential flats which automatically describes the relation between commercial and residential projects. Both are the support system for each other, none can survive without one other. For a strong society buildup we need both hands. As far as business in concerned we can say that anyone will happily invest in such projects which will cooperated with commercial and residential both. For example if anyone is investing in commercial project somewhere in interiors then there is a precise chances for the residential investors to invest in such interior area because there is an assurity that people will defiantly invest on such projects and they have every reason to get into in this deal. Hence, it has been proved that commercial projects help in the development of residential projects.